Don’t die. But if you do, hook your loved ones up beforehand. FIRE isn’t just about your numbers – it’s also about planning for your health and well-being in general. You go through life expecting to live happily ever after… but I’m sorry to break it to you, #$%^happens. No one really wants to think about this, but it will happen to you. That’s right, you’re going to die at some point. It might be decades from now or it might be today (though I hope it’s not! ), but you just never know. Regardless, if you die, your loved ones will appreciate that your affairs are in order beforehand. And here’s the thing, you can’t just consider what your spouse or partner will do because there’s always the possibility that you both will reach your demise at the same time. Man, this post is starting out to be pretty morbid – sorry about that (I’m really not). But the point is that you need to consider the possibilities all around. If you have kids, you damn well better have a plan in place for the idea that it’s possible you and your spouse die at the same time. Obviously, a will is critical and, in some cases, a trust can make a lot of sense. I talked about these things along with other powerful tools in my posts The Importance of Estate Planning and Protecting Your Assets. However, that’s not what this post is about. Today we’re focusing on giving instructions on bringing it all together and instructing where to find everything… a path to follow, so to speak. If you die, would your spouse or other person in your life know where to find your estate documents? Would they know what life insurance you have in place? Would they know how to access your social media accounts to shut them down (if desired)? Would they know any of your login credentials for any of your accounts on the Internet? Unfortunately, for many of us, the answer is no. And what’s even more unfortunate is that the accessibility of this information can easily be planned out ahead of time. The good news is that I’m one of those guys that’s meticulously organized. So, I’m going to take you through what I do and maybe that can help to spark some ideas of your own. First off, if you don’t have a fireproof safe, it’s time to get one. 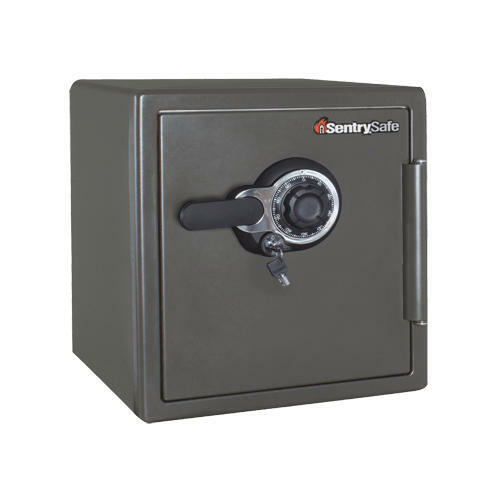 I personally own the SentrySafe Fire and Water Safe (SFW123DSB). It’s a good size to add all your critical documents with room to add more valuables as well. The interior measures out to be 13.8″ H x 12.6″ W x 11.9″ D. It’s currently floating just under $200, but that’s money well spent. Think about how easy this makes it for someone you designate to get to all these documents in one fell swoop. This is probably the most important thing you can do for those you care about. We’ll talk more about where to keep that safe combination shortly. It’s a digital world, my friend! Reading the above section, you’d think I’m an old-school guy who likes paper. I don’t. I hate it. I keep a copy of everything digitally and only print off copies of documents where I deem necessary. Every morning, I take any extraneous physical documents I received in the mail, scan them to PDF documents, and shred the original. I think I have a PDF copy of every bill I’ve ever had for well over a decade… and perfectly organized to boot! I’m not expecting all of you to be that much of a stickler when it comes to storing all your documents. However, if something happens and you lose all your physical copies of your important docs, it’s going to be a nightmare to get everything back on track. Keep a digital copy of all documents that would be important as it could pertain to your estate planning. This will keep your private financial matters out of the hands of prying eyes. I don’t want to get too technical, but even though I have my hard drive already encrypted, I still created a container just for my financial documents. The reason I did this was for backups and security. The encrypted container looks just like a single file filled with gobbledygook. Then when you open it and enter your password, it creates a new drive letter on your computer with access to everything. So when my backup runs, I have it skip that new drive letter and just backs up the single BitLocker file. It’s encrypted so even if the file is stolen, it’s useless to the thief. If you’re using a Chromebook, you’re not going to be storing your docs locally as that’s not the intent of these devices. You’ll be most likely keeping them in Google Drive. And that’s Ok, as your files on Google Drive are encrypted. It’s not my favorite place because it leaves more of a surface attack for them to be hacked. However, I think it’s still better than not having them together in the first place. And then, obviously, within each of these folders, I have the actual PDF versions of the documents. They’re named with the date a dash and then the name of what the document actually is. By having a good, organized structure in place, it makes it easy to update the documents as needed (new driver’s licenses for example). More importantly, it allows your loved ones to get to everything needed in one place. As soon as we start talking about digital copies of your important documents, we need to be talking backups. Hard drives die and more regularly than you might think! Or if you die because you’re burned in a house fire (pleasant thought, right? ), your computer’s likely going to be a goner as well. Don’t take the chance of losing everything! Have a backup in place. The best backups, in my opinion, are online backups. In other words, backups to cloud storage. And I’m not talking about syncing software like Google Drive, OneDrive, or DropBox. I’m talking about a true backup solution. This gets the data offsite so if a disaster happens (like a house fire), you can still get everything back. I’ve used CrashPlan for a number of years and love it. However, they’re in the process of leaving the consumer market. My replacement will be Backblaze by a long shot. From all the research I’ve done, this seems to be the best of the bunch for myself and most of you. You just install it and let it do its thing. It takes a while to back everything up the first time around, but after that, it just backs up new and changed files. In addition, they support 30-day versioning meaning if you save something in a document and want an older version back, BOOM, done. To top it off, their pricing is simple (and cheap!) – $50 a year per computer for unlimited data. That means you’re worry-free for all the data you can store on your computer for less than 5 bucks a month. This applies to both Windows and Mac users. 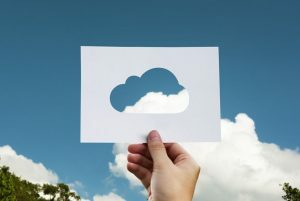 Chromebook users, your stuff’s already in the cloud and setting up how to create a backup solution for that is a little out of the scope of this post. If you aren’t already backing up your computer, please, please, PLEASE sign up for this immediately. It drives me bonkers that it’s so cheap and easy to back up your data and so many folks don’t have this in place. If you die from some disaster, that backup might be the most important thing your spouse or partner has the ability to access. You’re not using a password manager… what??!!! Let’s step back for one second from the whole idea of giving your family access to all your estate-planning documents. If you’re still using the same password for multiple websites, you’re going to be ticked off when you get hacked. You’ll not only have to go through the hassle of damage control on one account, but you’ll have to go through this for every single one that uses the same password. Please don’t put yourself in that position. Use a password manager. A password manager let you create one good password to access the encrypted passwords inside. That’s it – you just need to remember one password, so make it a good one! This gives you the ability to generate long, complex passwords for sites that you don’t need to remember. And that means you can have a different password for every single login you have. I’m on the extreme side, but I currently have 841 accounts in my password manager. Yes, you heard that right – 841. And of those 841, not one password is the same as another… there’s just no reason to have duplicate passwords. And here’s how we bring it back home… the password manager also puts everything in one place for your loved ones. When you die, they can now get to all the information they need to get things handled. They can then easily log in to your accounts and change things as needed. A password manager should not be optional – it should be a requirement for everyone. But it only works if you put things in it and update it with changes. You need to do this, but there’s no reason not to – it can make your life tremendously easier! Not only that, but I recommend you put everything in it! Think about this. If your wallet gets stolen and you have your credit card numbers and customer support phone numbers in there, how easy is it to call and cancel them?! And, here’s a perfect thing to put in your password manager… your safe combination! It keeps it secure while super easy to get to. 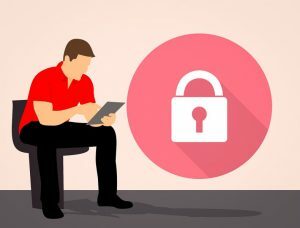 So which password manager should you use? It depends on what you’re after. 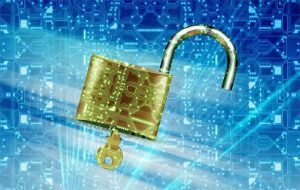 I use KeePass because it’s open-source, free, and can be stored locally on your computer. That doesn’t mean it can’t be stored elsewhere though. You can put the encrypted database in Google Drive, OneDrive, DropBox, so you can get to it anywhere. That means you can access it from any computer at any time. I use Resilio Sync, but that’s a little more involved than using one of the other places I mentioned. Regardless, that also means you can get to your passwords on your phone as well. Think about how convenient that is! KeePass isn’t the only guy out there though. There are some other good options that are even simpler than KeePass. LastPass is probably the most popular followed by Dashlane. Both of these alternatives are going to be much easier for non-technical users to setup and use. They integrate right into your browser for even more convenience. They’re both free, but offer premium plans for some additional features. Get yourself on a password manager if you haven’t done so already… and get your spouse to use one as well!! Here’s the best part – I put the password to my KeePass database in my wife, brother, and mom’s KeePass databases. That keeps it encrypted but they can easily access it if and when the time comes. Once or twice a year, I send an updated copy of my “Just in Case” email to my wife, brother, and mom. It should really be called my “In Case I Die” email, but that might come off as a little morbid. The key is that they don’t really need to do much at all. I asked them initially to create a folder in their email called “Backup (Jim).” Now when I email them, all they need to do is move the copy of the email to that folder… that’s all! In case something does happen to me, all the information they need is at their fingertips. This will take my wife (or brother or mom) through all the most important “chores” needed to get on top of our estate. Here’s a copy of the actual email I send to my wife, brother, and mom. Notice what I attach to the emails I send out as well. Move this email to the backup folder that you have for me in case you ever need it. • Life Insurance Policies through April Showers Insurance (for Mr. R2R and Mrs. R2R) – This was done through our broker, Kim Kong Insurance Agency (555) 555-1212. • Life Insurance Policy through Oak Kay Insurance (for Mr. R2R) – This was done through Jim’s work. • Long-term disability insurance through Up Chuck Insurance (for Mr. R2R) – This was done through Jim’s work. • Passports, Social Security cards, marriage license, etc. To get to the documents, you will need to use any Windows 8 or newer computer. All you should need to do is double-click on the “D:\Finances and Important Documents.vhdx” file. It should then prompt you for a password, which you will find in my KeePass file (see attached) with a title of “Windows BitLocker – Data.” Once the password is successfully entered, it mounts the entire file as a new drive on the computer (on my computer, it should be the “F” drive) named FINANCES. That’s it – all documents are then wide-open to be read. If the file is being opened from the flash drive, you might need to go into Disk Management to bring the drive online first. The encrypted drive should remain open until you shut down or reboot the computer. If you are shutting down or restarting the computer, you will want to detach it to prevent anything from getting corrupted. When you are done, open up “File Explorer” or “Computer”, right-click on the drive with the encrypted files (should be named FINANCES and is the “F” drive on my computer), and select Eject. If this was opened from on the flash drive from the safe, be sure to Eject the flash drive itself as well. If you need help with recovering anything, you can trust Pills Barry (555.555.5678). If he’s not available, talk to Jay Decay (555.555.9876). Both guys should be able to figure out anything technical or recover data (with or without my laptop being available). Most of my online accounts that allow it are set up to use 2-step authentication. That means if you try to access the account from a computer that hasn’t accessed the site before, you’ll have to authenticate with a PIN as well. Some are texted to my phone, some are done through an authenticator app on my phone called Authy (info is in KeePass), and some accounts have backup codes also listed in KeePass. So there you have it – a long post, but probably one of the most important considerations you’ll ever make. If you die, or something happens to you or your spouse, you want that transition to be easy for those you love. 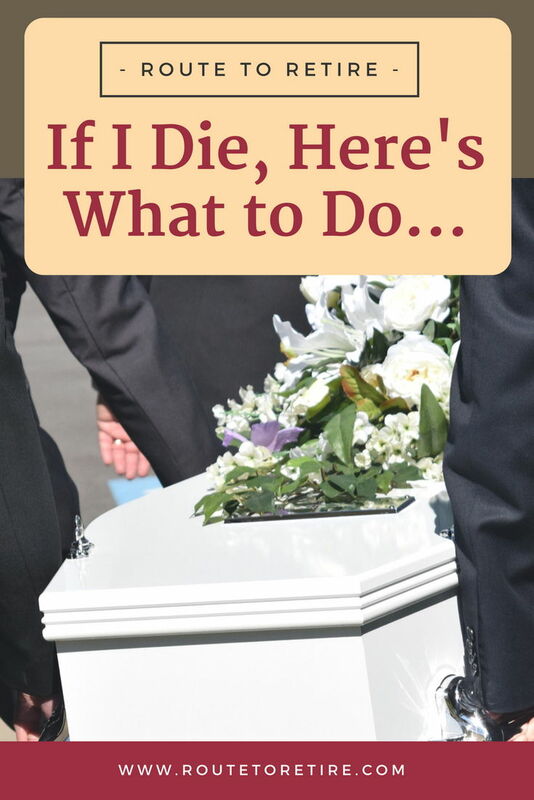 If you die, will your loved ones know what to do? What other ideas do you have for this? Great post, Jim. I’ve written an annual “Love Letter” to my wife every year after I update our net worth with 12/31 statements. I also use a password keeper (LastPass), and don’t know how I lived without it. Yes, it may be a morbid subject, but it’s critically important. Thanks for the great reminder! 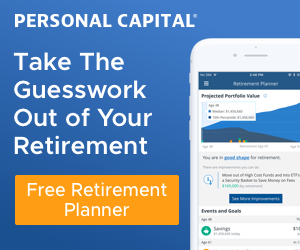 I thought I had all my estate planning under control, but you have some excellent additional ideas. 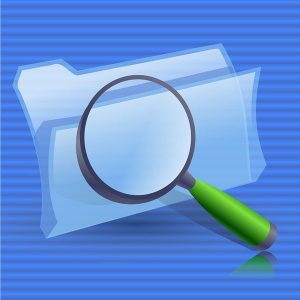 I have a password manager (safe-in-cloud) and estate planning documents, but I haven’t digitized the estate planning documents. Also, I haven’t written an “In case I die” letter which is an excellent idea. Thanks, Mr. Freaky Frugal! I think that letter can be the most important piece to tying everything together. You taught me a new piece of software – now I have to check out SafeInCloud! Do you like that one? Thanks for sharing this important information. I too have a document that I share with my wife and executors (both our kids). A couple of additional ideas for what to include are: 1) specific gift distribution such as a piece of heirloom jewelry that should go to a specific heir, 2) guidance on how you want your heirs to handle your estate such as investment disposal, consolidation, et al, 3) contact information for friends, family, and accounts, including credit bureaus, and 4) final wishes, as an example my in-laws have prepaid their cemetery plot fees and do not wish to have an extravagant memorial, just close family. Awesome ideas, PK! We have some of those things already in our estate planning documents, but I’m sure a lot of folks might not. I like the idea of getting the contact information in one place – including maybe that for the insurance companies as well. This is one area that I’ve neglected. I don’t want to think about it. Haha, love the “Ugh” in there! We had some do-it-yourself documents in place for a number of years, but I decided to get an estate planning attorney involved shortly after my daughter was born. That turned out to be a smart decision. It wasn’t cheap (probably a couple grand), but I felt tremendously better after that was all done. It was much different than the docs we had made and everything’s structured in a smarter manner – most of our accounts and assets are in the name of our trust, for example. How’d you get a copy of my letter? Um, I wrote it – you really thought I was asking for your autograph on that page because I liked you? This is great Jim, thanks for posting. I’m dealing with this now with my Mother. She’s in her late 80’s, doing pretty well all things considered. But if something happened to her right now I’d be in trouble. She doesn’t use a computer so I don’t have to worry about passwords and online stuff, but as far as her bank accounts and insurance etc I’d be in a lurch. My brother and I need to have a meeting with her to fix this but it’s a very tough conversation and one that’s not fun. I’m with you on the uncomfortable conversation, but such a smart move that you and your brother are working on having the discussion. Jim, this is a great, very informative post! Everyone needs a plan, but it is a very uncomfortable talk to have for most. Something like this has been on my mind, and is on my set of goals to get accomplished. Reading this just made that a priority. Thank you! GREAT and comprehensive post there Jim. This is my first read on your site, but will be following along. This is really important stuff. Last year I was in the hospital for a short stay and it really brought a lot of this stuff into focus. (even though I’m more prepared than most people). Thanks for taking the time to put this together. No one wants to think about this but it will happen to the best of us! I really like the idea of a letter especially as it has more personality to it than just a will. One of my file folders is called ‘to open when I die or retire’ so hopefully that humour will bevnever seen by a loved one! To Accidental Fire: While the conversation is awkward/uncomfortable, you can consider phrasing it ‘if you’re in the hospital and can’t pay your bills, us (you & your brother) having this info lets you focus on getting better, while we handle these things.” It’s a little less morbid. We all expect to be in great health, but Dad gave us a surprise end of 2016, and had memory issues for a while. Because things were well organized, my step mom was able to stay on top on things. As recovery progressed, they decided to pare down how many banks etc they have just for general ease of management too. I am super delinquent in compiling my accounts in a list. I’m going to have to refer back to this post for the secure digital resources you reference Jim. That’s been my hesitancy, making sure if it’s an electronic file, that it’s secure. I would also suggest for your safe, if applicable a copy of your mortgage, and your car title. My wife has all of my passwords. That way if anything ever happens to me, she’ll be ok from a financial and legal standpoint. Great move, Troy! 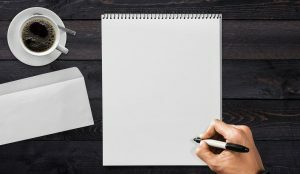 Does she have a list of everything you have out there as well (bank accounts, disability/life insurance policies, etc.)? Could be important if she’s not sure that a policy is even in place so she knows to lookup the account in the list of passwords. Having lost a few loved ones in the last few years, I would also say try to plan your funeral! I know it sounds morbid but it is such a painful time , the last thing you want your wife or kids to have to deal with is what did he want? There are so many options! You can just add instructions to your letter or get it all organized and paid for before hand! That’s a good one Caroline – probably one of the most important! A lot of folks probably don’t have that in place and I think you’re spot on that figuring out when the time comes would be tough. We have our wishes in our estate planning documents (hard copy in our safe and digitally on the computer). This really is so important, great list. I’ve started to do this, but it is not all completely organized yet. I’ll get on that right away. One question. What happens if your password manager gets hacked? Hi Bonnie – yeah, that’s a big old scary question, right?! All you can do is create steps to make this difficult to happen. The biggest key is to come up with a strong master password. That should be a password you’ve never used before either. Remember that the data is all encrypted, so without the password, it all garbage. Some of the password managers have the ability to add another form of authentication (multi-factor authentication). This can make it even harder for a hacker because they would also need your cell phone (or be able to intercept the SMS message) or a flash drive that must be inserted in your computer. The other important piece is where you’re storing the file. Keeping it locally puts you in a much better position, but you lose some of the convenience. Password managers like LastPass store your data in the cloud so your data is in their hands (they can’t access your data though). This becomes a balance of convenience versus security. Like I mentioned, I use KeePass, which is a database I store locally on my computer. I then use Resilio Sync to sync it between computers and my phone. I use that software because that cuts out the middle man. The data doesn’t get stored in the cloud (Google, DropBox, etc.). It just gets transferred in a peer-to-peer fashion which means just a little less surface area of vulnerability. This is a little more difficult to setup for non-techies though so that’s where something like LastPass might make more sense for a lot of folks. Great article, thanks for your help! I’m very interested in consolidating all of my passwords into a secured app that updates them. I’m concerned that doing so might impact my Mint account, which also needs access to the passwords. Does your password manager change your passwords frequently? How would access to Mint be affected by using a password manager? Hi Michael! Password managers don’t usually change your passwords for you – you do that manually. However, LastPass has an Auto-Password Change feature that you can turn on for select sites to make that happen automatically. The biggest functionality the managers provide is an encrypted container to organize them all. They can also generate long and complex passwords for you to use, but you’re still making the actual change on the site itself. So Mint should not give you any problems unless you decide to use a feature like LastPass has (if it’s even supported on those banking sites to begin with).